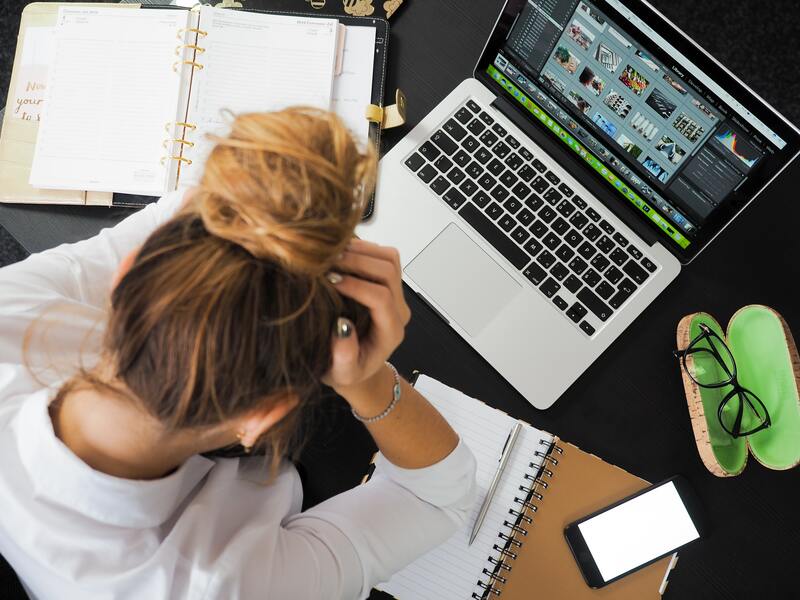 Managing your finances can be stressful for many people and when you add credit card debt and bad credit into the mix, stress levels begin to skyrocket. With many households dealing with debt in the thousands, it is no wonder that people are impacted in every part of their daily living. From what to eat to fear of losing their job, financial stress can really wreak havoc on every aspect of your life. With that being said, there are ways to help you deal with the stress and feel more in control of your situation. Below are 20 ways you can begin to reduce the stress of bad credit. Help yourself with the stress of bad credit and debt by seeking out a credit counselor. They are there to help you get control of your debt and come up with a debt repayment plan that will make your payments more manageable for you. You can check out the National Foundation for Credit Counseling website to learn more information and get in touch with someone. Also be sure to check out our guides that will help you in choosing the right credit repair company should you need to go that route. Hopelessness is something most people feel when they find themselves facing bad credit and financial issues. They are not sure where to begin to figure out where all there money is going and how they got into this situation. The best response to this is to hide what is allowing you to spend money...credit cards. Put them away, delete any saved credit card numbers online too. You can't use what you don't have. Most people go through financial hardship at some point in their lives so don't think you are alone in this. Reach out to friends, family members and co-workers. You will most likely find one person that can relate to your situation. When people know they are not alone, it can do wonders for their state of mind. If your stress is having an overwhelming negative effect on your well being, it may be time to make an appointment with a therapist. Having someone who will listen to you without judgment can make all the difference. They can also help you figure out the root causes that most likely landed you in this position. Having financial stress is a bummer, but you get to choose how you handle the situation. Switching up your attitude and making the decision to get in better control of your personal finances will go a long way in relieving stress. Take up reading and gather some finance books or check out the tons of finance blogs online. Educate yourself on how to get your finances in order and you are one step closer to feeling more in control of your life. Meditation has been proven many times over to have great impact on lowering stress levels and overall emotional health. Best part is it does not cost you anything to do it. Finding just a few minutes a day to clear your mind can make all the difference in your day. Try and build up your stamina since the more you do it, the more benefit you will see. Exercise as a stress reliever has proven to be extremely effective in boosting mood and overall well being. You don't need to run out and get a gym membership either (you are not looking to add another bill to your plate). Check out youtube and you will find tons of exercise videos to choose from. More of an outdoors person, take up walking or running. The key here is to just get your body moving and those endorphins going. A strong body equals a strong mind. In effort to not fall into the debt trap again, take the time to figure out how you ended up in financial turmoil. There is a definite link between shopping and happiness and/or sadness. As an example, let's say you pay off one credit card (cue happy dance) you now feel this sense of accomplishment and you may feel tempted to go out and "reward" yourself. You need to make yourself aware of this phenomena and make sure you do not indulge in it. On the flip side, you may be feeling sad one day and give thought to going out for a day of "retail therapy" to make yourself feel better. And chances are, you will feel better for a little. The key takeaway here is to be aware of the psychological effects of shopping and to not buy anything unless it fits in your budget and you have the means to pay for it in full at the time of purchase. If you don't, slowly but surely, you will find yourself back in the same poor financial situation. It can be easy to solely focus on what is going wrong in your life and leave all the good to the wayside. You want to avoid doing this. Reminding yourself of all you have to be thankful for goes a very long way in terms of having a positive emotional state. If you have your health, your family, good friends, a job, these are all things to be thankful for. As much as you need to plan for tomorrow, you only have today. Excessively worrying about the future can not only be unhealthy but derail what you need to be focused on for today. Focus on the important things in your life like family and friends. Your financial situation is not going to change overnight so don't spoil what you can be enjoying right now. The more control you have over your finances the better. Only you can go out and figure out how to make some extra income. Nowadays there are so many opportunities to make some side income. Baby sitting, dog walking or becoming an Uber driver, are just a few things you can do to make some cash if you are willing to put in some overtime. If you want to feel better when going through any type of stress, eat healthy. Make sure you are eating a nice variety of fruits and vegetable and you will physically and mentally feel better. A poor diet can affect your mood and overall well being. There are so many engaging activities that you can do for free at any time. Give thought to what brings you happiness and get out there and do it. Going for a bike ride, reading a book on the beach, going for a walk, the list can be endless. Don't waste time surfing the web because you think there is nothing else to do. Getting outdoors will do wonders for your mental state. Having the right working budget for you is key. It not only helps you stay on track financially but it will help you feel more in control which will give you more peace of mind. Whether on social media or in magazines, it can be easy to fall into the "I want what they have" mindset. This goes for TV as well with all the reality shows. All of this works its way into your subconscious and can affect your emotions and behavior. Not to mention your wallet. Life can throw unexpected curve balls your way at any moment. If you do not have money stashed away for emergency purposes, it is time to get one started. Try and save at least $1k to start and work your way up to saving at least six months worth of expenses. Having this will help you sleep better at night. In an effort to try and gain some control over your situation, put together a list of your creditors and call each one. Explain to the rep what your financial situation is and see if you can work out better terms. This can be a lower interest rate, a hold on payments etc. If you are behind at least six months with your payments, you can see if you can settle your debts. Offer to pay 40% or 50% of what you owe. The thing with this is that you will need to have that cash ready to pay off the final agreed amount. When people are dealing with the financial strain of bad credit and debt, anger is usually an emotion that accompanies it. This not only affects the person but those around them. The key here is to forgive yourself and this will lessen that feeling of regret and keep you from lashing out at others. 20. Set a few small reachable goals. This is one of our favorite tips for dealing with financial stress: a realistic plan of action. Instead of wallowing in sadness over the problem, express your solution to someone who can keep you accountable. Coming up with small attainable goals will set you up for reaching larger goals as you move along your financial journey. Instead of beating yourself up for spending so much money on daily lattes, come up with a plan on how you are going avoid doing this again next month. If you have worries about the stability of your job, diversify your income. Pick up an evening or weekend job. This will all help you feel more in control of your financial situation which leads to feeling less stressed overall. Dealing with the stress that comes along with having poor credit can have a very negative effect on your mental and physical well being. The key to navigating this challenge is to come up with the right strategies to help you feel less stressed and more in control. The above tips will help you decrease anxiety and stress helping you to tackle your financial woes with clear mind and a strong spirit.